This method provides information on health hazard likely to arise from exposure to liquid or solid test substance by dermal application. 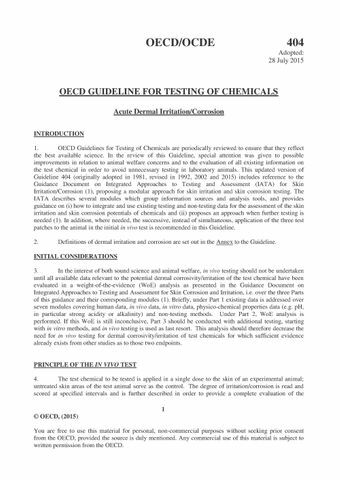 This Test Guideline recommends sequential testing strategies, which include the performance of validated and accepted in vitro or ex vivo tests for corrosion/irritation.The albino rabbit is the preferable laboratory animal. The substance to be tested is applied in a single dose to a small area of skin (approximately 6cm²) of an experimental animal; untreated skin areas of the test animal serve as the control. The exposure period is 4 hours. Residual test substance should then be removed. The dose is 0.5ml (liquid) or 0.5g (solid) applied to the test site. The method consists of two tests: the initial test and the confirmatory test (used only if a corrosive effect is not observed in the initial test). All animals should be examined for signs of erythema and oedema during 14 days. The dermal irritation scores should be evaluated in conjunction with the nature and severity of lesions, and their reversibility or lack of reversibility. When responses persist to the end of the 14-day observation period, the test substance should be considered an irritant.